Today I'm sharing a piece of writing from a writer whose work I enjoy. Often what Mitzi Smith writes resonates with my own heart and spirit. As I read Moving On I thought of what we have to do when we literally move on. We get rid of a lot of "stuff", we pack up what we really need and we hire a moving van to help us "move on". 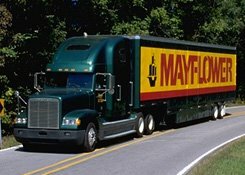 Hence, the picture of the Mayflower truck. That reminded me of the Pilgrims who sensed a real need to move on and leave the religious persecution in the "old world" behind and cross the sea to new opportunities and freedoms. Perhaps as you read this you will determine, as they did and as Mitzi has, to move on. Thanks for sharing your heart, Mitzi. It is time for me to MOVE ON. I must stop living in yesterday or tomorrow and live today, in this moment. I can learn from the mistakes of yesterday and prepare for the future, but today is what I am given to live to the fullest. I must lay off the weight that would press me down and allow My Savior to carry the baggage, or better yet, allow Him to erase it all. It is all under the blood, no longer to be seen or felt again. The scars remain to remind me of where the road has taken me. The scars also remind me of healing and His sustaining power. I am still here and was not pressed beyond what I could handle. My Daddy God has been with me every step of the way. He encourages and cheers me toward the prize. When Jesus is Lord over our lives and circumstances, we can walk through the fire and floods and not be touched because of His Blood pouring over us. As Children of the Living God we are often reminded that we are held in His arms and rocked in Assurance of Hope. Hope for today and the days that come. As for me, I’ll keep believing the One Who died in my place. The only One who is able to save, deliver and heal.